Clever Crow Pizza has a lot to crow about. The pizza quickly drew the attention of the foodarazzi in Columbus and a fella by the name of Tony Bourdain. The first version/location of Clever Crow was featured on the show No Reservations (video – here) which both annointed the place as artisan and acceptably cool for pizza eaters in the capital city. (Footnote on the video: Anthony Bourdain never visited Clever Crow – he just did the voiceover. If you watch carefully you will see Jeni Britton Bauer from Jeni’s and Warren Taylor from Snowville Creamery in the background shots). Those that have tried Clever Crow have largely become diehard fans after some initial disorientation. Clever Crow is decidedly different from any pizza you may have sampled before. In early January, Clever Crow opened a second location in the North Market down the street from it’s launching pad at Circus Bar. The North Market location makes the pizza more accessible to the masses with a more convenient spot and standard hours. What makes this pizza so special? First, the pizza maker himself. Gary Robinette has a food science degree from OSU. He learned the pizza pie making trade in Portland. He was also a brewer for Columbus Brewing Company. He takes artisan food crafting to a higher plain by making and curing his own meats (sausage, bacon, ham, etc). He buys much of his produce locally and pickles it for pizza posterity. As a pizzamaker he mixes and matches unique combinations of ingredients on his pies (such as grapes and Brie). People often refer to Clever Crow as the “place that puts corn on their pizza”. This is true. The corn is just not on the pizza, it is infused into it. The dough is a fusion of sourdough and cornmeal. It is cooked in a deep pan producing a thick, dense, chewy and crispy on the edges crust that is initially disorienting to new consumers. This is not your daddy’s pizza. This is not what you grew up with. If you can adapt to a crust and flavors that turn your pizza world upside down then you are likely to move on to the next slice. The North Market Clever Crow offers pizza by the slice. I suggest getting several different slices to share with friends since each flavor combination is very different. You can also purchase whole pies to pick up or eat at the market. Do beware and use caution. The density of the pizza paired with ingredients piled high means that two slices is usually a meal for most mortals. Good luck Gary and Brooke with Clever Crow 2.0. 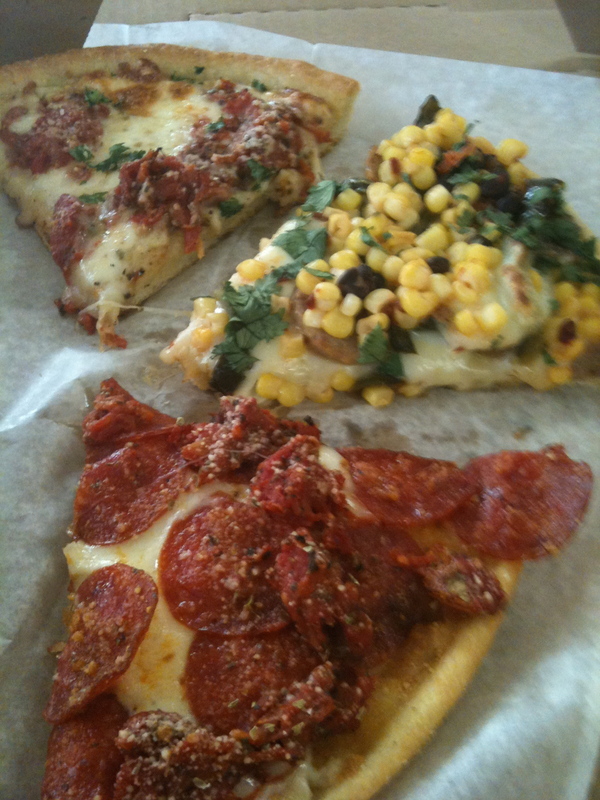 This entry was posted on January 15, 2011 at 10:16 AM	and is filed under pizza, Vegetarian Friendly. Tagged: Clever Crow, Clever Crow Pizza. You can follow any responses to this entry through the RSS 2.0 feed. You can leave a response, or trackback from your own site.